Future Business Leaders of America-Phi Beta Lambda is a national association of over 270,000 students interested in careers in business or business education. Phi Beta Lambda (PBL) is the collegiate, postsecondary division of the association. FBLA-PBL’s mission is to bring business and education together in a positive working relationship through innovative leadership development programs. To achieve its goals, Phi Beta Lambda provides members with a broad range of exciting conferences, publications, competitive events, and partnership opportunities. At state conferences, PBL members network with each other and state business leaders while attending numerous workshops on leadership development, community service, and much more. State officer elections are held at each state conference. At the Spring State Leadership Conference, PBL members compete in over 55 competitive events to earn the right to represent Arkansas at the National Leadership Conference. At the National Leadership Conference, PBL members seize the opportunity to compete against the best of the best in one of more than 60 competitive events. This is the ultimate PBL experience! PBL members participate in the National Officer election process and attend numerous workshops and networking activities during this four-day conference. The NLC is held in a different exciting city every year; in the past, NLCs have been in Orlando, Fla.; Anaheim, Calif.; Chicago, Ill.; and Denver, Colo.
SAU PBL national winners, 2017 PBL National Leadership Conference, Anaheim, CA. From left, Aric Callaway, Austin Taylor, Lera Street, Micah Larey, Aaron Brock. Why should you join PBL? In today’s highly competitive business environment it takes more than just a degree to succeed – it requires leadership skills, team-building experience, and technical knowledge. By taking advantage of the many programs PBL offers, students acquire the skills that will set them apart from the average graduate. Through active involvement, you will make connections and form networks and friendships that will last a lifetime. PBL will give you the opportunities, skills, experiences, and confidence to achieve your dreams! The Phi Mu Chapter of Phi Beta Lambda was chartered on September 22, 1971. Linda Beene, 1971 State and National PBL President installed the chapter’s seventy-five charter members and challenged them to develop a strong, active chapter. The Phi Mu Chapter of PBL evolved from the Commerce Civic Club. Tri-C, as it was known, was organized on the SAU campus in the later 1940s for the purpose of providing business students the opportunity to share social and learning experiences. Following three decades of successful operation, business students recognized the need for the affiliation with a national organization. Therefore, in 1971 students reorganized Tri-C and joined Future Business Leaders of America-Phi Beta Lambda. Since 1971, the Phi Mu Chapter has experienced sustained growth and success. Members of the chapter have won over 1100 state awards and over 200 national awards. The chapter has earned recognition as a Silver Chapter in Arkansas Phi Beta Lambda 31 times and as an Arkansas Gold Chapter five times. At the national level, SAU-PBL has earned the Gold Seal Award of Merit 34 times and was named a Gold Key Chapter thirteen times. 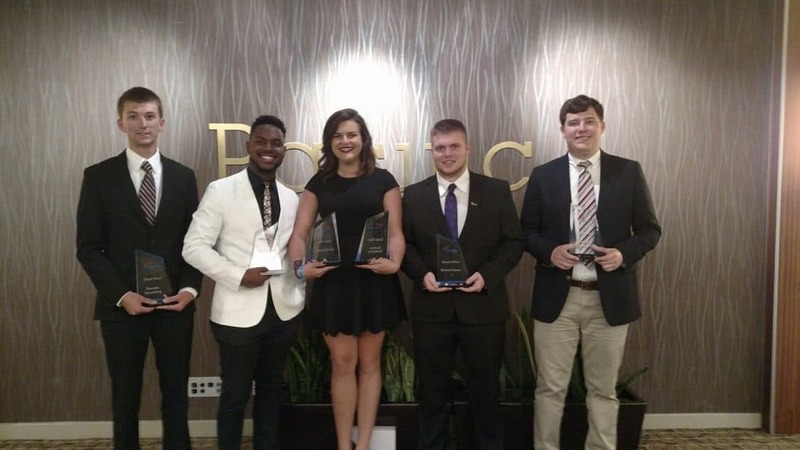 PBL has always been a big part of the SAU Rankin College of Business and the chapter plans to remain active in the state and national competitive event programs for years to come.